With regards to my impression of the students, I want to say that I was impressed with their questions—particularly the questions that evoked debate. These questions required plenty of thought to answer, and I felt that research must be done beforehand to give a substantial response. I observed that many of the students are hardworking, since a resonating theme of the questions referred to self-improvement, such as what is my philosophy in life and how would I overcome difficult academic subjects. 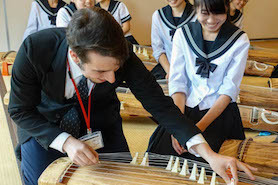 First and foremost, I was astonished by the level of inquiry of the students at Mishima-Kita High School. We have visited several high schools and not a single student has asked tough, politically relevant, and even cross-culturally taboo questions. I was extremely impressed by the girl who asked if the use of an atomic weapon on Japan during WWII was justified. This question is cross-cultural taboo between American and Japanese people. Its something nobody wants to talk about. This tabooness is exactly what made it a great question, because speaking about taboo subjects can be incredibly constructive. 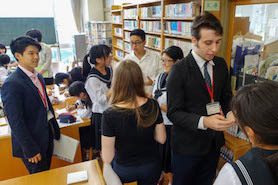 Students also talked to us about a myriad of difficult issues including the use of nuclear energy in Japan, Japanese debt, foreign military intervention of the Japanese army.